Conejo Valley Summer Open Recap & Results! 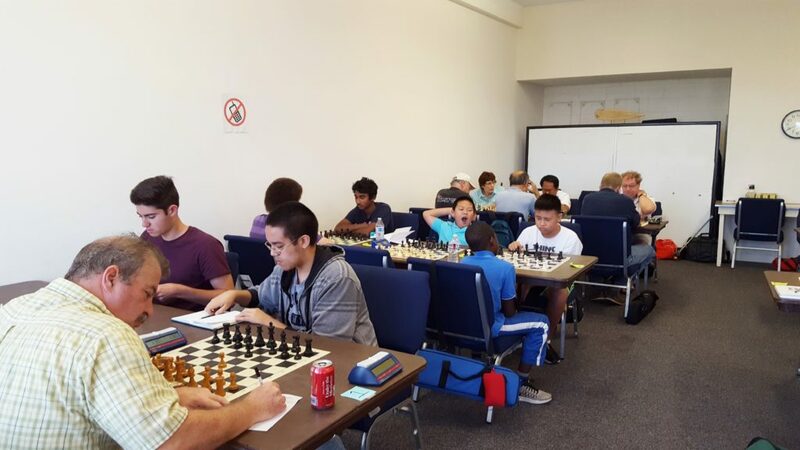 In July 2016, the Thousand Oaks Chess Club hosted its first-ever weekend tournament! 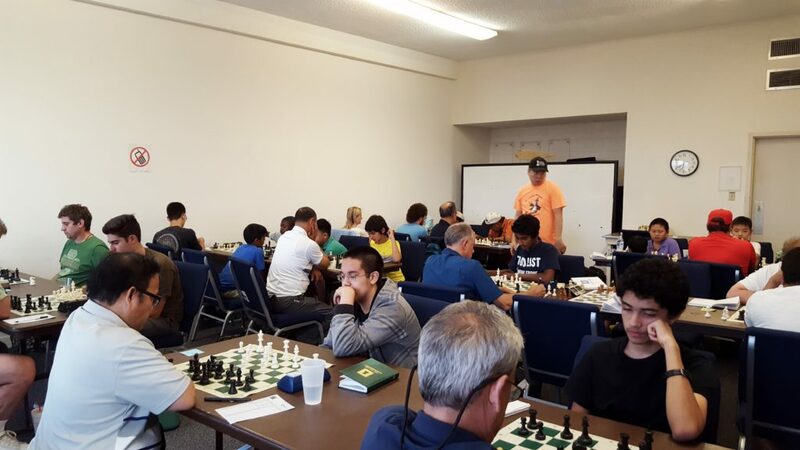 The 2016 Conejo Valley Summer Open was held Saturday and Sunday, July 30-31, at the beautiful Bethany Church on the Hill. This event attracted 49 players, and we gave out over $1900 in prize money! 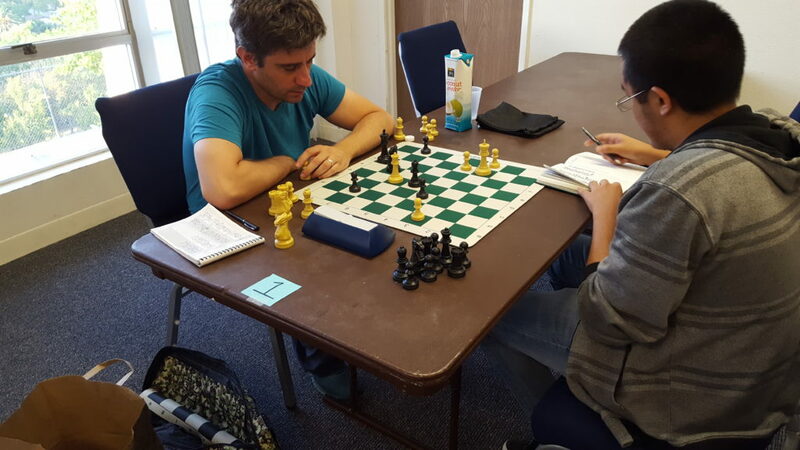 Taking place in three sections, 3 rounds were played on Saturday and 2 on Sunday at a moderate time control of G/90 d5. 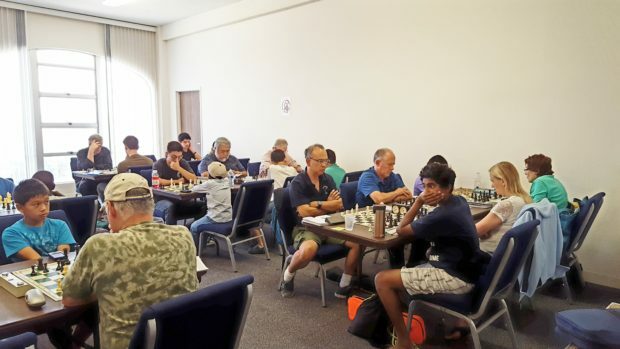 The venue was fantastic, and many players expressed their delight at having a local opportunity to play chess over the weekend. The strong competition produced many interesting battles, and more than a few upsets! This was especially true of the 9-player Open Section, which consisted of one FM, four NMs, and two strong experts, plus two Class A players. The first round saw upsets on all three boards! (Three players had round 1 byes). After 3 rounds, NM Craig Anderson was in clear first with a perfect 3-0 going into the second day. NM Leo Creger and Matthew Shuben trailed him with 2-1. In Round 4, Anderson ended up losing to Creger, and the two tied for 1st at 4-1, netting them a nice $300 each. Up-and-coming young expert Joaquin Perkins came from behind, winning his last two games, both of which were intense battles that could have gone all three ways for a long time. He took 3rd place with 3.5 points. A-player Renato Dikit took the Best Under 2000 prize. There were only 2 draws in the entire section! The middle section, Under 1800, saw a cool 25-player turnout. In the end, young Benjamin Bankhead emerged on top with a perfect 5-0 score, a full point ahead of his closest competitor. His performance as the only perfect score in the tournament earned him $280 in cash and 73 ratings points, pushing his rating over the A barrier for the first time! B-player Patrick Gordon-Davis executed an extreme “Swiss Gambit”; he dropped the first round to 1322-rated 6-year-old Bryan Xie, then proceeded to win the last 4 rounds to finish in clear 2nd with 4-1! 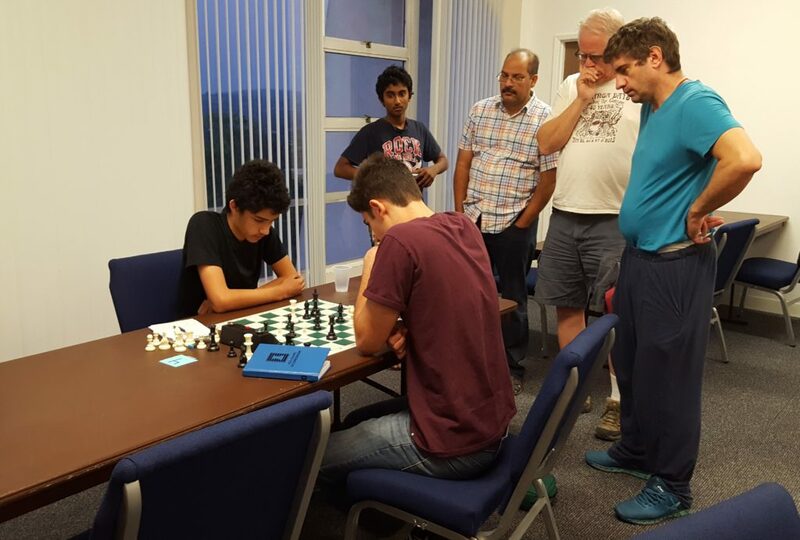 Regular TOCC players Samuel Katagi and David Steinhart split 3rd place, and 1445-rated Surya Bhamidipati clinched the Best Under 1600 prize, all with 3.5 points. Round 4 action begins. Board 1, NM Craig Anderson vs. NM Leo Creger, the eventual tournament winners, is in the foreground. The top board of the U1800 is right behind them. The 15-player Under 1400 Section had quite an unexpected champion! In this section, due to the large percentage of kids, we gave out trophies as well as cash prizes. Six-year-old Shravan Sriram, rated only 506 in the July supplement and 795 in the most recent unofficial ratings, came out on top. He had a perfect 4-0 score after the first four rounds (which included taking out the section’s top rated player, veteran Robert Armstrong) then “settled” for a draw in the last round to clinch clear 1st. He took home $160 plus the shiny 1st place trophy. Unrated player Neeraj Verma took 2nd place with 4-1 (he lost only to Shravan). Like in the Under 1800, the 3rd place prize was split between two players; 1030-rated Kaylee Yang and Armstrong. Both got $48, but her better tiebreaks netted Kaylee the 3rd place trophy. She was the lucky one that managed to not lose to Shravan in the final round! The Best Under 1200 prize was split three ways, between August Yin, Gabriel Lin and Ekaterina Kiseleva. Having the best tiebreaks, August clinched the cute mini-trophy. Riday Bhatrai took the Best Under 800 prize outright. All four players finished with 3 points out of 5. The final game of the tournament (Matthew Shuben vs. Joaquin Perkins, Board 3). This was a strange and intense battle. Click here for all new ratings on the USCF! Nick you did an awesome job running this event! ? It was such a blessing to watch your vision of hosting a weekend event becoming a reality! It was a blast planning and implementing this tournament with you! Very well organized event. Thank you Nick and Cindy for all your efforts! !